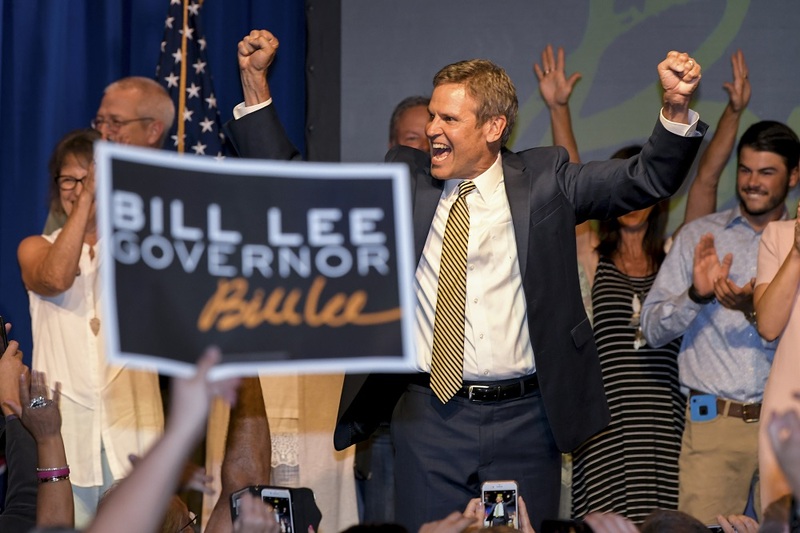 (CN) – Rather than pick a veteran of the state’s political scene, Republicans in Tennessee’s Thursday primaries voted for businessman and political neophyte Bill Lee to be the party’s candidate for Tennessee governor. The Associated Press called the race at 9:06 p.m. CDT. With 75 percent of the precincts reporting, Decision Desk HQ had Lee pulling ahead of his opponents with 37.4 percent of the vote. Billing himself as a conservative and an outsider, Lee chairs the Lee Company, a construction company with annual revenues of about $220 million. He beat out Randy Boyd, Tennessee’s former Economic and Community Development Commissioner, who received 24.7 percent of the vote. Congresswoman Diane Black collected 22.6 and Tennessee Speaker of the House Beth Harwell got 14.6. Lee will face Democratic candidate and former Nashville Mayor Karl Dean during the general election held Nov. 6. Before the election, Vice President Mike Pence stepped in to stump for Black. While appearing at a rally July 21 to celebrate the Trump Administration’s tax cuts, Pence praised his former colleague in the House. But words like that were not enough to prevent Black from finishing with less than a quarter of the votes cast in the GOP primary. But for the primary race to decide candidates to replace U.S. Senator Bob Corker, the night ended quickly. Minutes after polls closed for much of the state, the Associated Press called the Democrat and Republican races for U.S. Senate in quick succession. Former Tennessee Governor Phil Bredesen, a Democrat, will face the Trump-endorsed Republican Congresswoman Marsha Blackburn in the general election in November. Stepping into frame to supporters chanting “Phil!” Bredesen took to a Facebook livestream to celebrate the early return. When he began considering a run for U.S. Senate in October, Bredesen said he realized he would be spending much of the rest of his life jetting to Washington. But “unfinished business” compelled him to run, he said. Bredesen effortlessly scooped up over 90 percent of the vote against two perennial candidates. Meanwhile, at her victory party, Blackburn told her supporters the race to determine Tennessee’s next governor will “center on the differences.” Tennesseans, Blackburn said, want constitutional judges on the federal bench and they like the tax cuts Congress and the Trump administration passed. “We know that what Tennesseans say that they want to see in their next senator is somebody who is going to stand with President Trump, to finish the agenda that they voted for,” Blackburn said. In the 2016 presidential election, about 60 percent of Tennessee voters cast ballots for Trump. Richard L. Pacelle Jr., a professor of political science at University of Tennessee at Knoxville, told Courthouse News that the race between Blackburn and Bredesen could affect Brett Kavanaugh’s confirmation process to the Supreme Court if the vote is held after November and if Bredesen wins. “If the Democrats flip the seat, they are likely to have a decent chance of taking the Senate (if they win in TN, it probably means they are winning elsewhere),” Pacelle wrote. Before the results came in Thursday night, the Tennessee Secretary of State said that over 600,000 Tennesseans cast ballots in the two-week early voting period – a 11.1 percent increase from the number of voters who came out to vote in 2014. Among Democrat voters, early voting turnout increased 27 percent.